On January 28, 1949, an industrial accident occurred at Atlantic Avenue Station, causing a flash fire. Three people tragically lost their lives as a result, with 7 people injured. "Just as flame and dense smoke began rolling over the platform a train discharged more than 100 passengers. They were thrown into a panic as flames halted elevator service to the street and cut off the stairs. The station has a two-story kiosk above the street, and smoke and flames shot into the upper section from the elevator in the tunnel below. [A workman] was trapped on a platform at the top of the structure, where he was checking the elevator machinery. The two women victims managed to get up the stairs from the platform, but instead of emerging on the street, stumbled up another flight of stairs into the second level of the smoke-filled kiosk, where they were overcome." 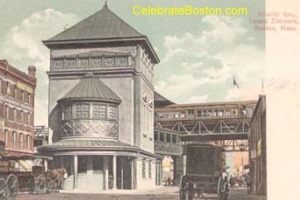 Atlantic Avenue Station in the East Boston Tunnel [Aquarium] was a bustling station at the time, as a large AT&T office building was located nearby. People escaped the smoke-filled platforms via emergency exits. A woman from Lynn, Massachusetts was credited with leading people to an emergency exit, saving many people from injury or even death."